A charabanc was an early form of bus, used typically for sightseeing trips. The conveyance may be long gone, but its name can still occasionally be found on old road signs, as here at Wookey Hole in Somerset. The original was French, char-à-bancs, a carriage with benches, so called because the original horse-drawn charabancs in France had rows of crosswise seats looking forward. 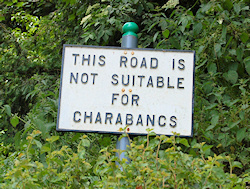 In that spelling it has been known in English at least since Lord Byron mentioned it in his journal in 1816, though it had soon been Anglicised as charabanc (so foreign, these accents). British speakers usually said it as sharra-bang when they didn’t abbreviate it to sharra (written chara). The heyday of the charabanc in Britain was between the First and Second World Wars, when it had been motorised but not yet fitted with any very effective shelter from the weather. Sometimes it was graced with a roof over the passenger seats but its sides often remained open to the elements or could be protected with inadequate curtains in inclement weather. It was a conveyance mainly for the holidaymaking proletariat out on day trips, who were disparagingly referred to by their social superiors as trippers. To such critics, the charabanc wasn’t so much a vehicle as a noisy self-propelled pub that conveyed a drunken rabble who threw bottles and bellowed bawdy songs. There used always to be a lot of summer visitors as long as I can remember. But nice quiet people who came here every year, not these trippers and charabancs we have nowadays. Sleeping Murder, by Agatha Christie, 1976. Last modified: 25 April 2009.